May I remind us all that the win that brought the America’s Cup to San Francisco Bay was a rescue mission. No one outside of Larry Ellison and his racing team had the wherewithal—much less the obsession of a junkyard dog—to break the Alinghi machine and come away with the prize. Then they went and changed everything. Had the Cup not turned over in 2010, the competition on the water might look familiar, but the terms of the match would not. Remember Alinghi’s proposed protocol for AC33 whereby the Defender would compete alongside the Challengers in the Challenger eliminations, take their measure, perhaps influence the outcome, and retain the right to dismiss any Challenger at any time? Remember how Louis Vuitton departed in disgust, but returned after Oracle won? It’s a cheap laugh, as the wags have had it since Alinghi’s Protocol was released in 2007, that it took Ernesto Bertarelli to make Larry Ellison look good. But I figure that one thread of the Masters of the Universe swagger the winning team carried home to San Francisco was driven by amazement that they had succeeded at all. Now, ten months ahead of the 2013 Challenger eliminations, we’re about to see an international catamaran circuit take to the waters of the next America’s Cup, and I note that this is five years since Russell Coutts, now CEO for the defense, Oracle Team USA, and Paul Cayard, now CEO of the Challenger of Record, Artemis Racing, partnered in an attempt to launch an international catamaran circuit. 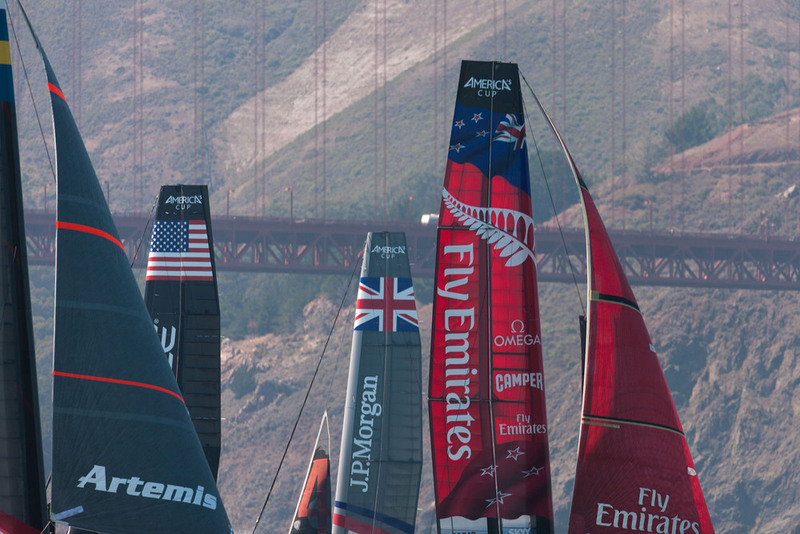 They failed five years ago because they lacked the lodestone, the America’s Cup. What remains to be seen is whether or not a circuit, grafted onto the side of the world’s most celebrated match racing competition, can develop a life of its own, with not just interest but a compelling interest in the outcome. It’s a harder story to tell and sell, when you’re not earning points toward the Cup, and I speak as someone who was recently interviewed by a reporter who wanted me on record as to “the stakes” of a high versus low audience turnout for August 22-26 America’s Cup World Series racing on San Francisco Bay. I didn’t exactly come through on that. I don’t think it’s make-or-break time. But, if the crowds turn out, cocktail chatter with “civilians” will be a lot easier between now and the big show in 2013. On the good news side, I find I can watch AC45 races (thanks, Stan) front to back. Previously, it was pretty much true that the only sailboat races I could watch all the way through were races for the America’s Cup. And let’s face it, the races weren’t always that interesting. The stakes made the difference. With Olympic sailing undergoing a 40 percent change in the “equipment” between 2012 and 2016, and the sport’s signature event changing everything but a Deed of Gift that permits almost anything by way of “mutual consent,” we have quite the burning churn under way. It’s a lot to pull off in the midst of a Depression, eh? And just as I have so often over the years, as one championship fleet or another came to town, I will take this opportunity to say, Welcome to San Francisco Bay . . . 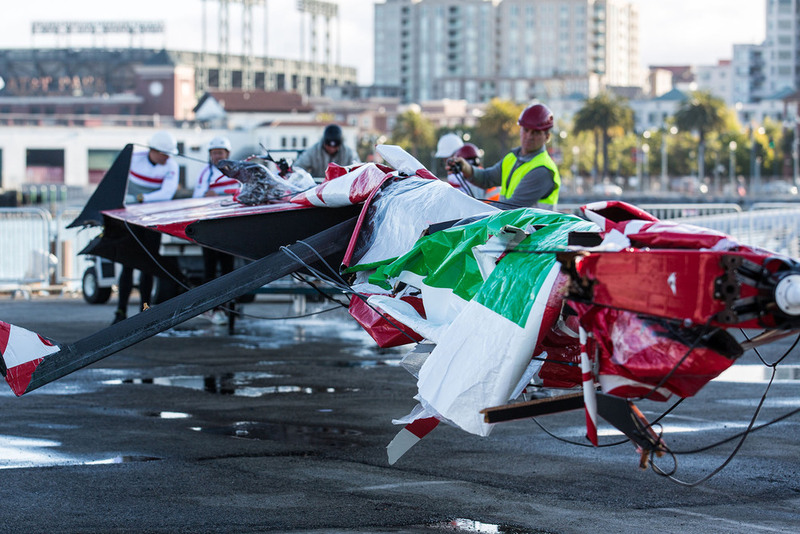 The wing from Luna Rossa Swordfish comes home a little the worse for wear.